Born in Illinois, John Malkovich, 64, joined Chicago’s Steppenwolf Theatre Company and won an Obie for True West in 1983. The following year he appeared with Dustin Hoffman in the Broadway revival of Death Of A Salesman in 1984 and won an Emmy after it was made into a TV film. He has received Oscar nominations for Places In The Heart and In The Line Of Fire, and also starred in Dangerous Liaisons and Being John Malkovich. 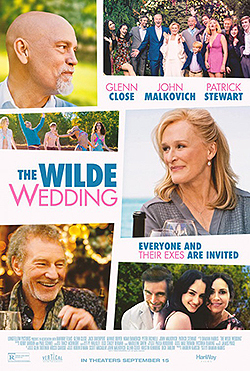 His latest film, 'The Wilde Wedding', is out on DVD and digital. After a whirlwind courtship, retired movie star Eve Wilde prepares to marry her fourth husband, the renowned English writer Harold Alcott. Sparks soon begin to fly when Eve's first ex and other guests arrive at her estate for a weekend get-together. He has two children with the film director Nicoletta Peyran; they have homes in Massachusetts and France. "Probably when our children were small, which is not to say I am unhappy now." "Playing hide-and-seek when I was really little, and getting into a disused refrigerator and closing the door to hide from my brother, which could have worked out very badly. But my father found me." "I admire the mother of my children a great deal, because she’s interesting, smart and funny." "Deplore might be strong, but general childishness, unseriousness and laziness in terms of what I’ve done compared with what maybe I should have or could have done." "Recently, at the Hotel Caron in Paris, I got up to use the bathroom one night and found myself out in the hallway instead. But that is one of a million: I am a constant source of embarrassment to myself." "So many, but certainly The Sound And The Fury by William Faulkner. “No battle is ever won he said. They are not even fought. The field only reveals to man his own folly and despair, and victory is an illusion of philosophers and fools.”"
"Doing nothing. I used to be able to prepare for work much more quickly. My brain just doesn’t work on the same level any more, so now my “do nothing” time is 95% gone." "I am not super-sentimental about stuff, but I have a little stuffed bear our son, Loewy, gave us; and our daughter, Amandine, gave me a key chain." "It used to be smoking, which, I think, in the end, even if you are not doing it, is still a habit." "That people are so certain about things that you really can’t be certain about." "Julian Sands, who is one of my very oldest friends. It would be nice to see Harold Pinter again. It would be interesting to meet Nina Simone, whom I have always admired, although I doubt she was a day at the beach." "When I was an idiot high school student, as opposed to being an idiot adult, I used to drive very fast." "If one could shut off the modern world and all the information that flows, not necessarily into your brain but at your face, and doesn’t benefit anything or make one better informed." "By my friends as hopefully someone who was a good friend, or at least amusing, but I don’t need to be remembered by people I don’t know."